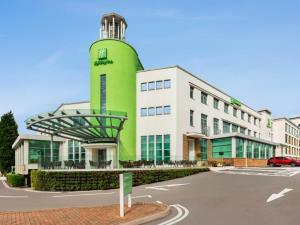 Holiday Inn Birmingham Airport and NEC HotelConveniently located just one mile from Birmingham Airport complex and the National Exhibition Centre, this contemporary hotel is ideally located for both business & leisure needs. The hotel has 239 bedrooms, an extensive onsite Aspire Conference Centre, catering for conferences up to 600 people and the Inspire Leisure Club with gym & indoor pool. Conveniently located just one mile from Birmingham Airport complex and the National Exhibition Centre, this contemporary hotel is ideally located for both business & leisure needs. The hotel has 239 bedrooms, an extensive onsite Aspire Conference Centre, catering for conferences up to 600 people and the Inspire Leisure Club with gym & indoor pool.